Arizona State University is on a mission to empower its students to enact powerful and positive social change. 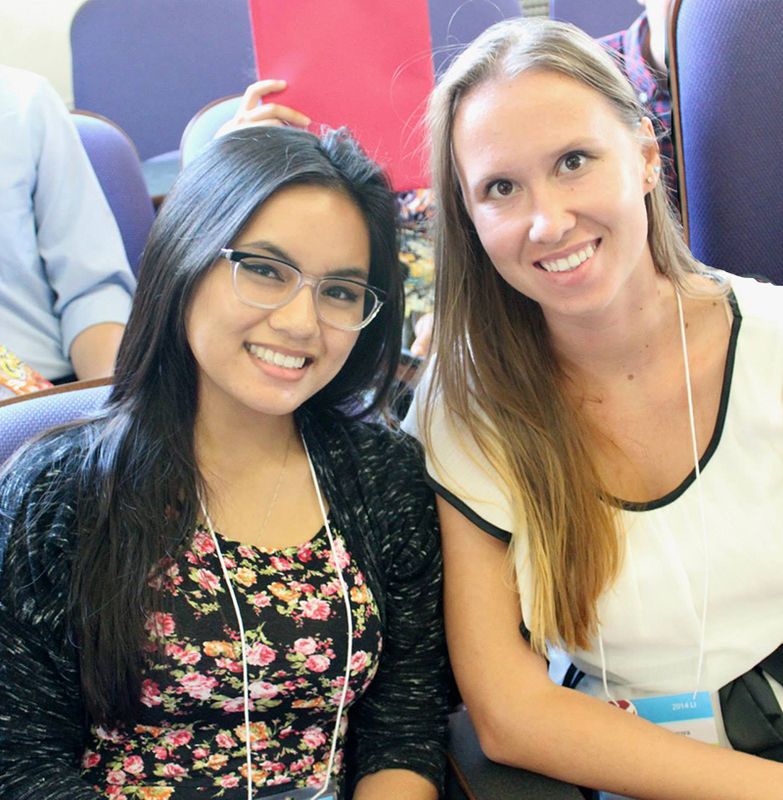 One outgrowth is its relatively new GlobeMed chapter, helmed by undergraduate honors students Megan Atencia and Anna Simperova. GlobeMed partners its chapters with communities to create sustainable health solutions specific to the communities’ needs. ASU’s chapter is matched with ICOD Action Network in Lyantonde, Uganda, and focuses on families and orphans affected by HIV/AIDS. Rather than simply throwing money and supplies at a crisis, the GlobeMed model invests in learning about community issues and working with the local partner to determine the best ways to create lasting change. Examples include building housing and sanitation structures and providing microloans for farming and income generation purposes. Founded in 2012, GlobeMed at ASU is composed of roughly 25 active members whose academic programs range from anthropology and biological engineering to sustainability. The group is diverse, representing various ethnic and religious backgrounds, with several international students and first-generation Americans. Each summer, the chapter typically sponsors two to four interns who travel to Lyantonde for an average of five weeks to assess needs within the partnership, take metrics of success for past projects and act as a liaison between Lyantonde and ASU. This year, Sophia McGovern, a double major in creative writing and global studies, did the honors. On the ground, McGovern was able to solidify the chapter’s partnership, put faces to names and immerse herself in the culture while witnessing the daily lives of people in the community. The experience, which she calls “all-around amazing,” helped her understand areas for improvement in the partnership, such as extending the scope of assistance for a previous beneficiary who was provided a home. Most of the GlobeMed at ASU members found their way to the group through in-class presentations or ASU-sponsored events like Passport to ASU. But their reasons for caring about global health issues are unique. Atencia spent her youth living all over the U.S. as a military kid, but she is profoundly connected to the island of Catanduanes in the Philippines, where her parents were born and raised. In 2013, she interned in the hospital and rural clinic in her mother’s hometown. Here, she saw first-hand how the locals struggled to survive – sickened by being forced to drink from the same water sources where farm animals relieve themselves, weakened by malnourishment – while trapped in a vicious socio-economic circle. Before choosing the program, Atencia was planning to become a musician. A lifelong performer, she came in contact with people who were mentally, emotionally or physically unwell, and noticed that music touched them in healing ways. She credits music with instilling in her the desire to heal others and pushing her toward a career as a physician dedicated to addressing all aspects of wellness. For Simperova, the call to help others came early. She can’t remember a time when she wasn’t interested in being a pediatrician. However, it wasn’t until college and joining GlobeMed that she realized how critical a role global health plays in the sphere of medicine. She immediately and strongly identified with GlobeMed’s mission to provide housing and sanitation for orphaned children in Uganda. Simperova is particularly interested in issues surrounding prenatal and maternal health, and her work with GlobeMed provides a real-world look at these challenges. As poverty is endemic to the Lyantonde community, most women do not have access to ultrasounds, prenatal vitamins, clean water, medical information or treatment. Poor infrastructure in rural villages makes transportation to health centers or hospitals difficult and sometimes impossible, which increases the risks of complications for mother and child. “Most of us cannot imagine not having clean water for a day, let alone during the course of a pregnancy and childbirth. By installing water tanks, we can begin to make an impact on the lives of our beneficiary families,” she says. Atencia and Simperova encourage those interested in shaping global health from a grassroots perspective to connect with GlobeMed at ASU. Membership is open to all. The GlobeMed at ASU chapter meets from 5 to 7 p.m., every Thursday, in SHESC 265, on the Tempe campus. For more information, contact asu@globemed.org. 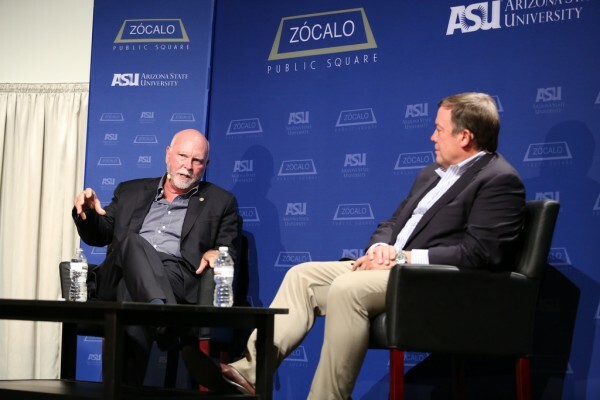 ASU President Michael Crow spoke with biologist and entrepreneur J. Craig Venter about our current understanding of what life is during a Zócalo Public Square event, co-hosted by the university. Editor's Note: This story was taken from zocalopublicsquare.org. ASU President Michael M. Crow, the evening’s moderator, opened the discussion in front of a full house by asking Venter how he went from serving as a Navy corpsman in Vietnam to running three scientific institutes – and predicting that human beings will one day reproduce organisms synthetically. From studying adrenaline receptors, he moved on to trying to sequence a gene associated with adrenaline, laying the groundwork for a number of scientific firsts: In 1995, he sequenced the first and second genomes. In 2001, he sequenced the first human genome. In 2010, he created the first synthetic life form. Today, said Venter, we can interchange the digital code of ones and zeroes with the four-letter code of DNA. “DNA is our software,” he said. “Every species on this planet is a software-driven system.” And our ability to transition between the digital and DNA worlds has huge implications: Today, biology can be sent through the Internet. Venter and his team are now in the process of sequencing thousands of human genomes each year so that by 2020, we will have millions sequenced. This data, he said, will give us the ability to know precisely “what’s nature and what’s nurture” within the next decade. This knowledge, said Crow, will have enormous implications, from human longevity to our understanding of race. But what are we going to do with it? Are we going to be able to close the gap between “natural science” – what we know and understand – and “design science” – what we do with what we know? “It will be overwhelmingly tempting for humanity to refrain from using this knowledge to modify our species,” said Venter. He referred to a survey from 15 years ago in which a surprisingly large number of respondents said they’d choose to genetically modify their children. It’s not unreasonable to want to eliminate lethal diseases that are not treatable, he said, but other traits pose problems. Manic depression is a disease that’s difficult to treat, yet people who are manic depressive are also among society’s most creative. Could curing manic depression wipe out the creativity of our species? We’re a long way from having the knowledge we need to take such steps, cautioned Venter. And what exactly is synthetic life? Crow asked Venter to explain how he created a bacterial cell entirely out of synthetic DNA. Venter explained that his team took a common bacterium, removed the operating system, and put in a synthetic operating system. Then, measuring every protein in the cell, they found there wasn’t a single protein from the original cell. “You change the software” – the DNA – “you change the species,” he said. The idea of creating new life forms comes with serious ethical and safety concerns. Crow, referring to Isaac Asimov’s “Three Laws of Robotics,” asked Venter if he had rules of engagement for synthesized life. Asimov’s rules for governing robot behavior sort of apply, said Venter. We’re trying to create things to help humanity, not eliminate it. And we don’t want the things we create to become weapons of war, he said. What, asked Crow, are your worries about human enhancement? Venter noted that a knee replacement is a kind of enhancement. But he does have concerns: In the new do-it-yourself biology movement, people perform experiments at their kitchen sinks that previously would have been limited to laboratories. Ebola only has eight genes, said Venter; could kids, trying to be wise guys – like computer hackers – try to synthesize the Ebola virus? Fifty or 100 years from now, said Crow, when most of the things you’ve dreamt have occurred – and the impact has been a net positive – what will be the most fundamental and significant changes resulting from digital biology? Venter said that it was impossible to answer the question without looking at biology as a whole. The way the world works now, if digital biology extended our lifespans to 250 years, we would quickly overwhelm the planet. But, if we could use sunlight and carbon dioxide as our carbon sources instead of coal and oil, perhaps we could find a way to increase our lifespan in a way that’s healthy for humans and the planet. Digital biology has the potential, Venter said, to create a new Industrial Revolution. We’re not just trying to change life but all human processes. “It’s a giant experiment, and hopefully we’ll be smart about it,” he said. The audience question-and-answer session included more queries about ethics and the possible dangers of synthetic biology. How could a synthetically created virus be stopped? Venter said that we’re in far more danger from new emerging infections than we are from synthesized viruses. Synthetic biology already has combatted such infections: When the H7N9 flu virus broke out in China, Venter’s team successfully created a vaccine based on a digital copy of the virus Chinese scientists sent to the U.S. We can now transport viruses without putting people in danger – and transport vaccines, too. What can we do about scientists who don’t share Venter’s ethical concerns dealing in genetic engineering? Venter said that society faces the same challenges with any technology. “You can kill somebody with a hammer; you can build a hospital with a hammer,” he said. The U.S. does have stopgaps in place to monitor do-it-yourself scientists, and laws that govern lab practices. The rules aren’t that complicated, he said – but scientists must learn them, and must work in the proper environment to ensure that their experiments are performed safely and without catastrophic consequences for society at large.